Rooftop with the fireplace. That is probably the most romantic way to pop the question. City lights, cool wind and hot flames will definitely make a magic combination together. Propose on the terrace outside and enjoy glasses of champagne by the fire. Make a double surprise for her. Tell her that you going to the new bar and bring her to the rooftop. Propose with the Empire State at your background. After she said “yes” tell her that you going to the restaurant for the celebration, but instead take the elevator one flight down and surprise her with friends and family gathering. Perfect winter proposal with the family! Its a scavenger hunt season. You can include your friends for this proposal idea. Sign up for the scavenger hunt or make your own. Leave the clues and answers all around the city. Let the last one be the address of a private terrace. Propose with the view and let her wonder how you organize all that . Gallery show opening. Official invitation to the new gallery opening will lead to the private space with the pictures of you two. Candles will show you the way, Make a walk through the relationship and propose on a terrace overlooking the Manhattan skyline. Perfect indoor and outdoor proposal idea. Rent a penthouse suite with the private terrace and chief. Little fancy holiday proposal idea will bring you to the luxury hotel in the middle of Manhattan. As soon as you open the door to your suite, you will see candles and rose petals all around the room. Follow the rose path to the terrace, where the fireplace will set up and a chill champagne will be waiting for you. Get on one knee and ask the main question. Bring the celebration to your room. The private chief will be cooking your favorite food and you can just enjoy the time with your love. 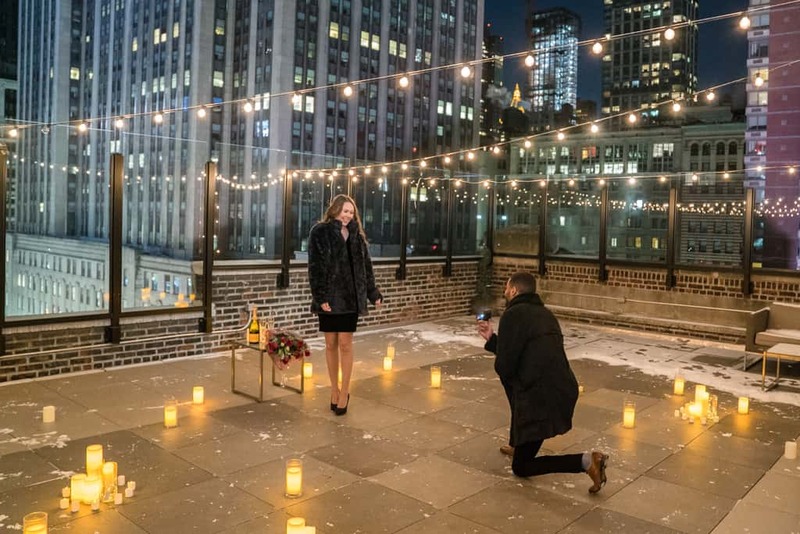 This is just some of the proposal ideas that can be done on a rooftop during the winter time. Of course there is always a chance of snow, but believe us, there is nothing more romantic then staying up on a rooftop with your partner under the snow and enjoy the beauty of the city.